Our high-quality borosilicate standard-grade Erlenmeyer flasks meet ASTM standards at a great value. With thick, uniform wall thickness; white enamel metric scale; and a marking spot, each flask can be heated and used with acids, salt solutions, and organic solvents. 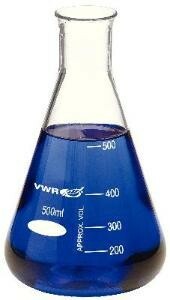 Weiterführende Links zu "Pyrex© Erlenmeyer Flasks"
Weitere Info "Pyrex© Erlenmeyer Flasks"
Kundenbewertungen für "Pyrex© Erlenmeyer Flasks"